Janet Williams, 64 of Indian Trail went home to be with her Lord And Savior Jesus Christ on February 4, 2019 she was surrounded by her loving family. She is survived by her husband Gary and daughters Tammy Lynch (Eddie) and Lisa Caputo(Howie), grandchildren Ashley Williams, Brianna Almond, Amber Caputo, and Garrett Lynch And great grandson, Jaxson Greene. Along with her sisters, Joan Dotson, Brenda Poole, Georgia Melton, Terrie Neeley and her brother Kenny Hucks. Janet enjoyed cooking and doing crafts. She loved spending time with grandchildren and playing with her great grandson. She loved family time and really enjoyed taking family vacations. 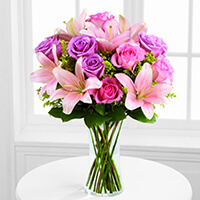 To send flowers in memory of Janet Hucks Williams, please visit our Heartfelt Sympathies Store. Wingate University Campus Services purchased the The FTD Farewell Too Soon Bouquet for the family of Janet Williams.